Goodreads appetizer: Olivia Brent is happy with her quiet life in the country, until the imminent loss of her home forces her to embark on a search for her estranged father. Catapulted into a world of criminals, Olivia is out of her depth. When she meets the stunningly gorgeous and enigmatic billionaire Luc Severino, her world is turned upside down. Jimmy Brent’s daughter was the last person Luc ever wanted to be with, but she’s the key to finding her father,the man Luc has wanted revenge on for over ten years. He’s willing to use any methods available, including blackmail, to persuade Olivia to help him find Jimmy and put the past behind him. 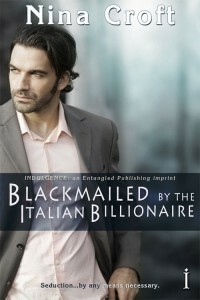 My Thoughts: Blackmailed by the Italian Billionaire is another wonderful recently released title in Entangled Publishing's new Indulgence line that readers who love category romance but still want their stories to be quality novels will enjoy a lot. Blackmailed by the Italian Billionaire starts with a modern Romeo and Juliet premise: the incredibly handsome and charismatic Luc has sworn revenge against Olivia's (Lia to her friends) father, and when after eluding him for more than 10 years, Luc has given up and is ready to move on enters Lia, and it seems the key to finding the man who ruined his and his whole family's life has been handed to him. And of course as they are interesting characters on their own, when Nina Croft brings them together it gets even better! The attraction between them, the tension, the sparks they all kept me glued to the page and well past after midnight (or even 2am...). One major plotline that didn't sit well with me was how Lia declared that she hated her father. To understand and accept such strong emotions from such a soft and kind hearted character I would have needed to see more reasons or get more explanation to how and why she could hate her own father (sorry but if it's only based on her mother's/parents' self-destructive love that doesn't convince me, that's just not enough to warrant such violent emotions like hatred towards a parent). My other problem was that we were left without explanation regarding many details: just to name a few of the main ones: the what and why of Olivia's dad's involvement in Luc's imprisonment (why did he do it? 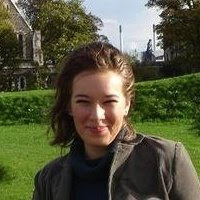 and why to Luc personally? ), then we never got to know the specifics of why Luc went to prison (yes because he killed a man, and I get that as a sign of trust Olivia must not have questioned that, but we readers would have liked to get an explanation, and I think Olivia deserved one too). Though the Romeo and Juliet, starcrossed lovers, sworn enemies lovers trope was at the base of this novel I found that the characters got over this detail too quickly. There was not much agonozing and tortured dilemma (I missed this mostly from Luc's part who has passed the past 10 years hating a man and he got over that pretty quickly and without much turmoil - or at least we didn't witness it). He got to his feet, moving to stand in front of her. Lia stood up as well, not wanting to be at a disadvantage. A wave of apprehension passed through her, but she stood her ground. She was determined she wasn’t going to be intimidated, but he was just so big, and she’d always been better at dealing with horses than she was humans. Maybe she should treat him like a stallion she was training. Stand up to him, show him who was boss…and if all else failed—castrate him. Verdict: Blackmailed by the Italian Billionaire is not flawless and I wish some things were a bit better developed, but nonetheless it was a very enjoyable, fast and lovely read. If you'd like a quick, engrossing and passionate light read, Blackmailed by the Italian Billionaire is a good choice.